To address the potential correlation between plasma concentrations of venlafaxine (VEN), its active metabolite O-desmethylvenlafaxine (ODVEN) and the active moiety, AM, (ODVEN + VEN) and adverse drug reactions (ADR) in a large naturalistic sample of in- and outpatients. We compared plasma concentrations of VEN, ODVEN and AM and dose-adjusted (C/D) levels as well the ODVEN/VEN ratios between patients complaining ADRs, following the Udvalg for Kliniske Undersogelser side effect rating scales (UKU) (n = 114) and patients without ADRs (control group, n = 688) out of a naturalistic database. We also investigated potential pharmacokinetic correlates of the four UKU categories by comparing patients complaining ADRs with those who did not. Based on previous literature we applied different ODVEN/VEN ratio values as cut-offs to split our sample into two groups at a time and compare frequencies of ADRs between the groups. No differences for demographic and pharmacokinetic variables including plasma and C/D concentrations as well as ODVEN/VEN ratios were observed between study groups. Neither the comparisons between females and males nor between elderly and non-elderly patients revealed significant differences (p > 0.05 in all cases). No differences were also reported exploring the patients complaining ADRs from the 4 UKU categories separately. After applying various ODVEN/VEN cut-offs, groups did not display differences in frequencies of ADRs (p > 0.05 in all cases). Our findings do not demonstrate a direct link between venlafaxine metabolism measures and ADRs. Therefore, additional dimensions are needed to be considered in future trials aiming to disentangle the involved aspects of ADRs in patients receiving venlafaxine. The authors wish to express their gratitude to the number of people who contributed with excellent professional technical as well as pharmacological competence to build up the KONBEST data base with 50,049 clinical pharmacological comments as of February 2nd, 2016 (ranked among the professional groups in historical order): A. Köstlbacher created the KONBEST software in his Ph.D. thesis based on an idea of E. Haen, C. Greiner, and D. Melchner along the work flow in the clinical pharmacological laboratory at the Department of Psychiatry and Psychotherapy of the University of Regensburg. A. Köstlbacher and his colleague A. Haas continuously maintain the KONBEST software and its data-mining platform (Haas & Köstlbacher GbR, Regensburg/Germany). The lab technicians performed the quantitative analysis: D. Melchner, T. Jahner, S. Beck, A. Dörfelt, U. Holzinger, and F. Pfaff-Haimerl. The clinical pharmacological comments to drug concentrations were composed by licensed pharmacists and medical doctors: Licensed pharmacists: C. Greiner, W. Bader, R. Köber, A. Hader, R. Brandl, M. Onuoha, N. Ben Omar, K. Schmid, (A) Köppl, M. Silva, (B) Fay, S. Unholzer, (C) Rothammer, S. Böhr, (D) Braun, M. Schwarz; M. Dobmeier, M. Wittmann, M. Vogel, M. Böhme, K. Wenzel-Seifert, B. Plattner, P. Holter, R. Böhm, R. Knorr. Authors are also grateful to Dr. A. Sakalli Kani, Department of Psychiatry, Sivas, Turkey for her valuable feedback and Dr. G. Ozbey, Department of Pharmacology, Akdeniz University Medical Faculty, Antalya, Turkey for providing orientation in how to interpret data from her study. 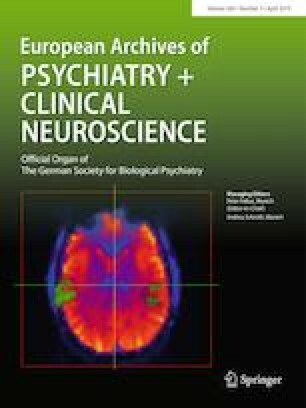 Finally, the first author has based his dissertation in terms of British Association for Psychopharmacology (BAP) Certificate Part II on this work supervised by Professor P. M. Haddad, Department of Psychiatry, Hamad Medical Corporation, Doha, Qatar, to whom authors are particularly grateful for his feedback. Participated in research design: GS, EH, CH, KE, FR, TV, GG, MP. Performed data analysis: GS, MP. Wrote or contributed to the writing of the manuscript: GS, EH, CH, KE, FR, TV, GG, MP. This research received no specific grant from any funding agency in the public, commercial, or not-for-profit sectors. Georgios Schoretsanitis received a grant from the bequest “in memory of Maria Zaoussi”, State Scholarships Foundation, Greece for clinical research in Psychiatry for the academic year 2015–2016. Ekkehard Haen received speaker’s or consultancy fees from the following pharmaceutical companies: Servier, Novartis, and Janssen-Cilag. He is the managing director of AGATE, a non-profit working group to improve drug safety and efficacy in the treatment of psychiatric diseases. He reports no conflict of interest with this publication. Christoph Hiemke has received speaker’s or consultancy fees from the following pharmaceutical companies: Astra Zeneca, Janssen-Cilag, Pfizer, Lilly and Servier. He is managing director of the psiac GmbH which provides an internet-based drug–drug interaction program for psychopharmacotherapy. He reports no conflict of interest with this publication. Gerhard Gründer has served as a consultant for Allergan (Dublin, Ireland), Boehringer Ingelheim (Ingelheim, Germany), Eli Lilly (Indianapolis, Ind, USA), Janssen-Cilag (Neuss, Germany), Lundbeck (Copenhagen, Denmark), Ono Pharmaceuticals (Osaka, Japan), Otsuka (Chiyoda, Japan), Recordati (Milan, Italy), Roche (Basel, Switzerland), Servier (Paris, France), and Takeda (Osaka, Japan). He has served on the speakers’ bureau of Eli Lilly, Janssen Cilag, Neuraxpharm (Langenfeld, Germany), Lundbeck, Otsuka, Recordati, Roche, Servier, and Trommsdorf (Aachen, Germany). He has received grant support from Boehringer Ingelheim and Roche. He is co-founder of Mind and Brain Institute GmbH (Zornheim, Germany) and Brainfoods GmbH (Zornheim, Germany). He reports no conflict of interest with this publication. All other authors declare no conflicts of interest as well. This research work was conducted in accordance with the Code of Ethics of the World Medical Association and the local regulatory authority of RWTH Aachen University hospital. No sources of funding were provided for this project. No potential conflicts of interest are reported.